PAUL BELLINGER PHOTOGRAPHY: BILLINGS MONTANA PORTRAIT PHOTOGRAPHER – THE GRAFFITI ARTIST IS PRESENT! BILLINGS MONTANA PORTRAIT PHOTOGRAPHER – THE GRAFFITI ARTIST IS PRESENT! Meet Shylo, one of the most prolific graffiti artists in Billings’ new graffiti alley behind Good Earth Market and Pug Mahon’s. 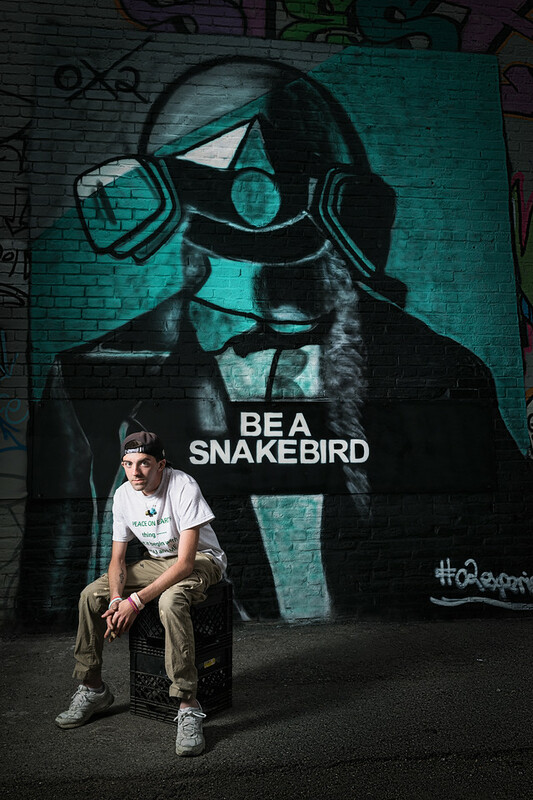 Shylo is unique in the world of graffiti for being a Christian graffiti artist who regularly paints religious themed artwork such as the “Snakebird” piece featured here and a number of murals for churches across the country. We’re lucky that Shylo has recently decided to move to the Billings area and will soon be blessing the region with more amazing graffiti. Stay tuned for more photos featuring this artist’s work soon. Tips for photographers: This photo was made outside on a cloudy day and is lit with one light, a large silver bounce umbrella high to the camera left. I like working with bounce umbrellas because unlike a shoot through umbrella, which spills light everywhere, a bounce umbrella is easy to control the direction of light. The key to the light placement in this photo is the angle and direction to create a Rembrandt pattern on Shylo’s face and the ratio of light on Shylo versus the mural in the background. The light is about 5 feet away from Shylo, which is further than I would normally place a light for portraiture (depending on what I’m going for, but I like it close and soft with dramatic falloff in general). I chose to put the light further away than I normally prefer because if it were too close the falloff would be too quick and there wouldn’t be enough light on the background (of course I could drag the shutter to let some ambient light up the background, but that’s not the route I took because I was shooting handheld and wanted the mural to be in sharp focus). I'll be posting a BTS photo of the setup on instagram soon so be sure to follow @PJBellinger.